Our ‘boutique pousada’, Quinta Azul lies in the stunning Santa Teresa hills of Rio de Janeiro, offering visitors glamorous boho chic-style accommodation in a romantic oasis of calm. Lying in tranquil tropical gardens overlooking Rio, it is ideal for those after comfortable, affordable luxury to rival Rio's top hotels. Just 10 minutes away from Rio’s beaches, Quinta Azul sits right in the heart of lively Santa Teresa village, an artsy historic town that likes to party. The land was discovered on 1 January (Janeiro) 1502 by Portuguese navigators who mistook Guanabara Bay for the mouth of a river (Rio). Sixty years later the Portuguese crown established the city of São Sebastião do Rio de Janeiro and then spent two years expelling French traders after ‘Brazilwood’. In the 18th century the city became the main shipping port for gold and diamonds, and, from 1763, the colonial capital of Brazil, which lasted nearly two centuries. By 1891, Rio had a population of over 500,000, making it one of the largest cities in the world. Mountains were removed and bay water reclaimed as the city grew. Today with a population of over six million, it is the sixth largest metropolitan area in the Americas (26th in the world). With independence and the creation of Brasilia in 1960, Rio de Janeiro ceased to be the capital city, but remained the most popular, with its stunning backdrop of mountains and tropical forest on one side, and popular bay and beaches, including the world famous Copacabana and Ipanema, on the other. Other eye-popping sights include the statue of Christ Redeemer (Cristo Redentor) on Corcovado mountain, recently declared one of the Seven Wonders of the World and Sugarloaf mountain (Pão de Açúcar) with its cable car. Rio is also famous for its incredible carnival and spontaneous street parties: the most spectacular are 'Reveillon' (New Year's Eve) and its annual three-day ‘Carnaval’ in February where costumed dancers (desfiles) perform the Samba down the Sambódromo, a grandstand-lined parade avenue. 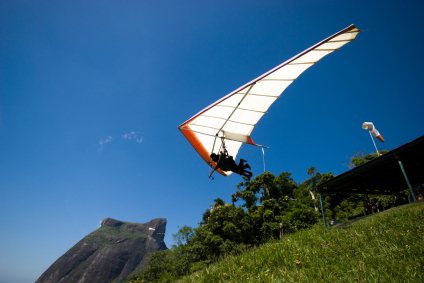 Boasting some of the world's largest football stadiums, Rio is also the epicentre of Brazil’s national sport. In 2014, the children constantly seen kicking balls in the streets will be hoping for a glimpse of the world’s top players when the city’s Maracanã Stadium hosts the FIFA World Cup final. In 2016, the Olympics will be held there too, the first time in a South American city. Our boutique pousada, the Quinta Azul, is located in the heart of Rio de Janeiro's most bohemian quarter, Santa Teresa, just across the Lapa arches on the picturesque street car - the Bondinho de Santa Teresa. 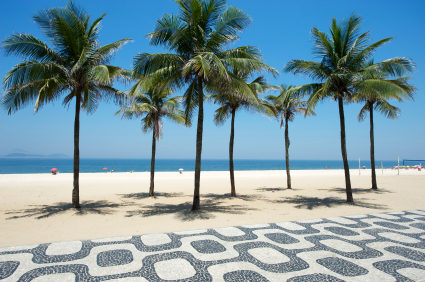 While many who travel through South America are only interested in hotels in Rio's most famous spots, like Copacabana, Ipanema, Leblon, The Quinta Azul offers the authentic Rio experience. There’s much more to Rio than its beaches and Santa Teresa is one example. 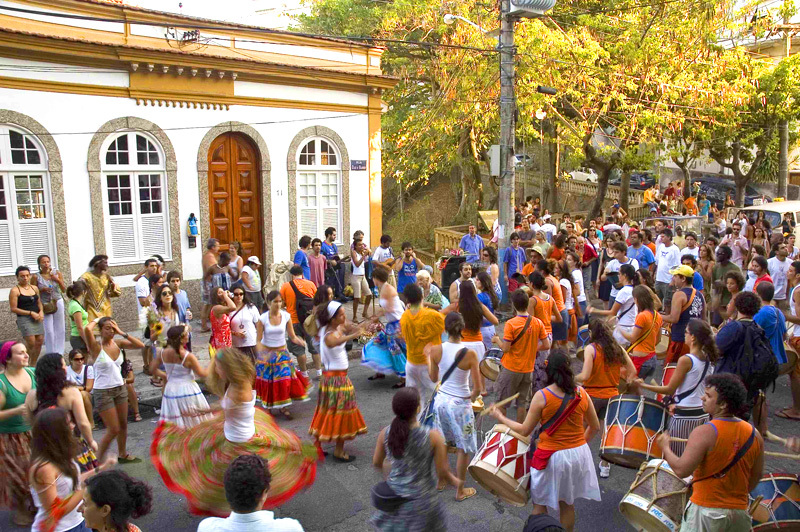 The bohemian neighbourhood of Santa Teresa is located on top of Santa Teresa hill, overlooking the centre of the city. A great way to experience the ‘real Rio’ and a favourite haunt of artists, poets and musicians, Santa Teresa is famous for its winding, narrow, cobble-stoned streets with countless stunning vantage points – and a 100-year-old tram. This area, known as Rio’s answer to Montmartre, originally grew up around the eighteenth-century Santa Teresa Convent. By the early twentieth century it became an upper class borough dotted with magnificent mansions. Many of these, like the convent, are still standing. In 1896, the Carioca Aqueduct was converted into a tram line for the Santa Teresa Tramway (bondinho or ‘little tram’). 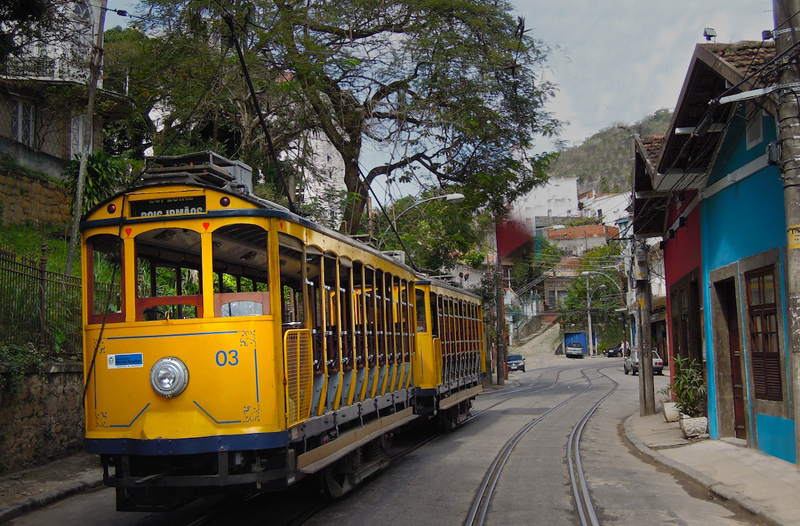 This historic tram still takes visitors to Santa Teresa today from the Carioca Station in downtown Rio. About a decade ago, Santa Teresa was revitalised as an artistic hotspot with a lively community, and is now home to art studios, galleries and graffiti art, as well as restaurants and bars. But the beautiful panoramic views of Rio de Janeiro and Guanabara Bay haven’t changed. Museu do Bonde, tells the story of the Santa Teresa tram, when pulled uphill by donkeys. 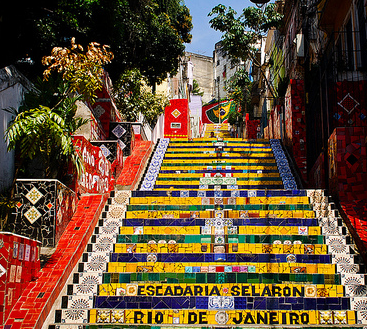 The Selarón stairway, 215 steps decorated with regularly-changing mosaics, created by Chilean artist Selarón who moved to Brazil in 1983. Largo dos Guimarães, Santa Teresa's busiest area, with most restaurants, bars and art studios. Nearby Largo das Neves, the last tram stop, also has popular bars and the Nossa Senhora das Neves Church. The Santa Teresa Convent, and the Ship House (Casa Navio, 1938) and Valentim Castle (Castelo de Valentim, late nineteenth century), near Largo do Curvelo. Parque das Ruínas (Ruins Park), a culture centre with fabulous 360-degree views high up the hill, which hosts exhibits and shows. Centro Cultural Laurinda Santos Lobo (Rua Monte Alegre 306, phone: 55-21-2242-9741), which occupies a vintage Santa Teresa house, pays homage to an outstanding woman. Centro Cultural Casa de Benjamin Constant, once home to Brazil's greatest republicanist. 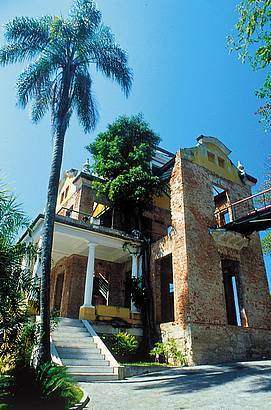 The museum and its grounds are a perfect example of a typical Santa Teresa chácara (country house).